Steven Jochums is a Staff Engineer in the Renewable Energy business unit of Underwriters Laboratories, LLC. He has worked for UL for over 17 years and served in many different positions at the company. Steven has worked as both a product safety and performance reliability engineer in the Photovoltaic industries. Additionally, he worked in product assessment for safety in the Power Systems and Power Supply categories. He has been involved with photovoltaic module evaluation and testing since 1997 and its development at the Northbrook office. He has served on many different safety standards development committees over the years. Prior to joining UL, Steven worked for over 19 years the consumer electronics industry in direct sales and marketing with Team Electronics of Peoria (IL). While living in Peoria, Steve was actively involved with the Peoria L5, a local chapter of the L5 Society, which promoted space commercialization, colonization and exploitation for economic benefit of all mankind. He worked with the Lakeview Museum of Arts and Sciences’ planetarium staff in conducting model rocketry workshops and events, to increase awareness in space sciences. Peoria L5 also conducted annual model rocketry events at Illinois Central College in East Peoria during the “Spaceweek” period in July, which commemorated the Apollo 11 mission and helped to increase public awareness in space sciences. After the “Challenger Accident” in 1986, Steve and Peoria L5 founder Robin Miller were called upon by local media to serve as “local experts” in space activities during coverage of the event. Peoria L5 also conducted a Challenger Memorial event at Illinois Central College, which provided information on the causes of the accident as documented in the Rogers Commission Report, as well as information on how the country should respond, by placing the goals of the National Commission on Space Report as the blueprint for America’s future in space exploration and exploitation. In 1987, a year after the 51-L accident, Peoria L5 hosted a massive Spaceweek event with Lakeview Museum, which featured guest speakers from John Deere in microgravity research, McDonnell-Douglas on Shuttle-based medical product purification, Comcast Corporation on satellite communications, and others on NASA budget planning and the National Commission on Space report. The event featured a “Space Banquet,” which offered guests Shuttle-based rehydratable foods and special guest speakers. Steve was presented with the 1987 Peoria L5 Space Pioneer Award for his service and contributions to the space advocacy community. Prior to Peoria L5, Steve founded and operated the Illinois Valley Aerospace Club in his hometown of Roanoke, Illinois. The club focused on model aircraft and model rocketry and conducted numerous public launch events in Central Illinois and the Chicago suburban areas, as representatives of model rocket product manufacturer, Estes Industries. IVAC’s crowning achievement was conducting fund raising events from 1977 to 1981, and then taking the club to witness the first launch of the Space Shuttle, STS-1, as invited guests of NASA on April 12, 1981. The organization operated from 1974 until 1984. Besides STS-1, Steve has also attended the launches of STS-4 in 1982 and STS-133, the final flight of Orbiter Discovery on February 24, 2011. He has toured the Kennedy Space Center 11 times from 1970 to 2012, and toured the Marshall Space Flight Center in Alabama in 1977, 1981, 1982 and 1993. Steve has actively studied and researched the American Space Program, with an emphasis on both static and flying space modeling since 1966. 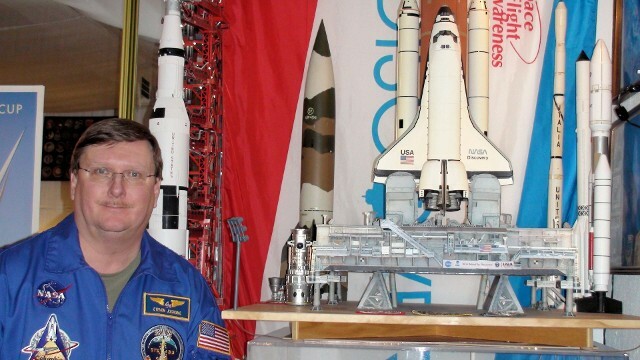 His scratch-built Shuttle launch complex model in 1/144 scale was used by Revell Corporation in 1984 to illustrate a forthcoming production scale model kit at both the Dallas Hobby Show and the New York Toy Fair. The same model was used as the centerpiece for the Spaceweek 87 event at Peoria’s Lakeview Museum. Steve continues an active space modeling hobby, with published articles of both real and fictional spacecraft models in numerous magazines and websites. Once at UL, Steven became the Primary Designated Engineer for UL 1703 – Photovoltaic Modules and Panels, from 1997 until 2003. During this time, Steven served as a U.S. delegate for IEC Technical Committee 82 (Photovoltaics), Working Group 2, which worked to create and maintain the IEC standards on PV equipment. Steven also served as a U.S. Technical Advisory Group (TAG) representative to the IEC, the IEEE and ANSI. Today, Steven still serves as Senior Regional Lead Reviewer for photovoltaic products. He has helped provide training for UL engineers from seven different countries in order to help UL provide more localized service to the PV industry worldwide. Steven was presented the UL GM’s Award in 2005 for helping to provide specialized testing for UL PV clients in Northbrook. Steven holds a bachelor’s degree in Electrical Engineering Technologies from Bradley University and is a Professional Engineer-In-Training in the state of Wisconsin. Steven also holds an Associate’s Degree in General Education from Illinois Central College. Steven has attended numerous UL University provided training courses, as well as serving as an instructor to UL University-operated training sessions for new Photovoltaic Product Engineers from 2007 to 2009.